Anthony Bourdain coming to the Lincoln Theatre to discuss and sign his book...Medium Raw! If you're obsessed with his show, his travels and his rock star attitude, then don't miss your chance to meet the Travel Channel's coolest culinary genius, Anthony Bourdain, host of No Reservations. 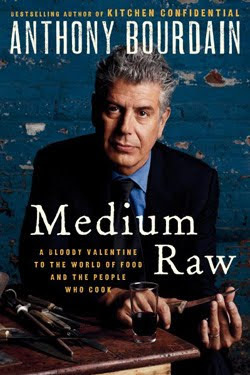 Bourdain will be signing and discussing his latest book called Medium Raw: A Bloody Valentine to the World of Food and the People who Cook (retail price, $26.99). The best-selling author will be at the Lincoln Theatre (541 Lincoln Road, Miami Beach) on Wednesday, June 30th, at 7:30 p.m. How can you make it into the theatre doors? Purchase your own copy of Bourdain's new book at any Books & Books in Miami and receive one (1) ticket to the book signing event. Make sure you hurry because tickets will go fast! To learn more about his show, visit Bourdain's website or read his travel blog. Medium Raw...just how I like my meat! I LOVE HIM!! His show's awesome & he's so real/natural! Love it, cant wait to see him..thanks for the info! Electrify your look at Electric Couture in Miami! Cindi Lauper is coming to MIAMI in August!